We may think of soufflés as a fancy dessert that we pre-order in an elegant restaurant, certainly not something we make at home and serve to guests. But this recipe for a vanilla dessert soufflés may change your mind. With just seven ingredients (that are probably already in your kitchen), and a few simple steps, you will have a beautiful vanilla soufflés in under an hour. It is as light as a cloud and full of sweet, unadulterated vanilla essence. It's also a recipe you can prepare for any menu—from a special occasion to an everyday meal. Finish it off with a dusting of confectioners' sugar and serve with a few, plump berries for a treat that's at once visually spectacular and surprisingly easy. Butter a large soufflé dish and sprinkle in 1/4 cup of granulated sugar, tilting the dish to make sure the entire interior surface is covered. Set aside the prepared soufflé dish. Bring 1 cup of the milk to just steaming in a medium saucepan set over low-medium heat. In a bowl, stir together 1/3 cup granulated sugar, 1/3 cup all-purpose flour, and the remaining 1/3 cup milk until it forms a smooth batter. Slowly whisk half of the hot milk into the batter, making sure to combine the ingredients until they are completely smooth. Add the tempered batter back to the hot milk in the pan and bring the mixture to a simmer, stirring constantly. Stir and cook the mixture until it has thickened, for about 1 minute. Stir the butter into the mixture until combined. Allow batter to cool at room temperature for 10 minutes, then stir in the vanilla extract. In a separate bowl, beat the egg whites on medium-high speed until they become foamy, and then add the remaining 2 tablespoons sugar. Continue beating the egg whites on high speed until they hold stiff, glossy peaks. Gently stir 1/3 of the egg whites into the vanilla mixture, then carefully fold in the remaining whipped egg whites. The vanilla mixture should be evenly colored and light and bubbly, without egg white streaks or marbling. Spoon the soufflé mixture into the prepared dish and allow it to rest, covered, for up to 30 minutes (or you can bake it right away). Bake for 25 to 30 minutes (slightly longer at high altitudes) until the soufflé has risen and has a crusty exterior. Serve the soufflé with a dusting of powdered sugar and a few plump berries, if desired. Don't skip coating the soufflé dishes, as this is one of the most important steps. 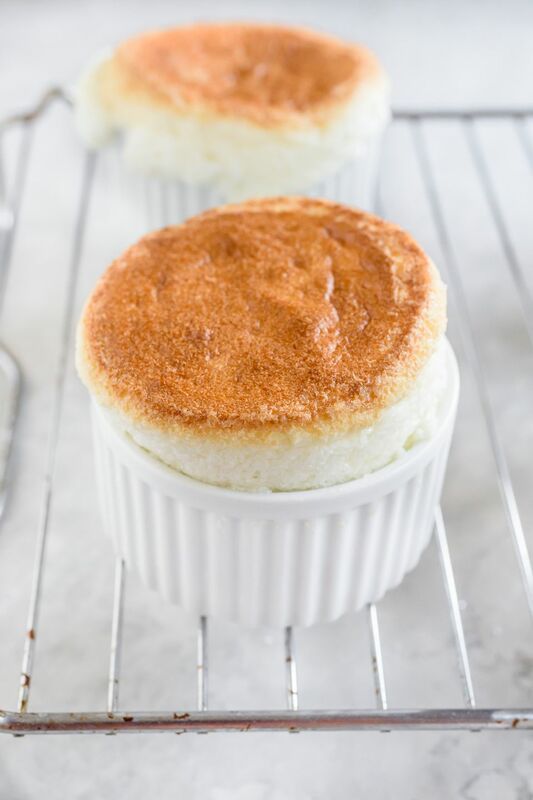 If you skip this step, you run the risk of the batter sticking to the sides of the ramekin and the soufflé won't rise properly. The Ultimate of All Souffles is the Lemon.